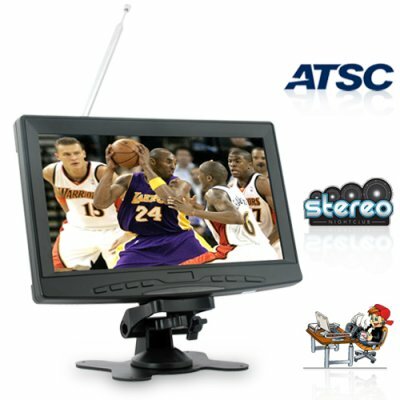 Successfully Added 9 Inch Digital Television - ATSC Widescreen Digital LCD TV to your Shopping Cart. Digital TV set with 9 Inch LCD screen (16:9) with built in ATSC / NTSC tuner for North America and other areas using the new ATSC digital TV standard. Its 2009 and digital TV is here! Don't miss a single minute of your favorite sports and TV shows - if you are ready to upgrade your desktop or car TV to the new digital TV standard, then the CVFQ-E06 is the product for you! With this right-sized 9 Inch LCD TV you have a modern digital television with a built-in tuner, so there is no need for a clumsy converter box. Do you like to watch TV while you are working at your computer desk? Do you need a TV in the RV/Van/SUV to keep the kids entertained? Do you want to watch TV while you are cooking in the kitchen? Then have we got the TV for you! This flat screen LCD television is stand mounted or wall mounted easily and has built in stereo speakers to allow you to hear the action clearly even if you are on the other side of the room. A direct to you low wholesale price means you can order one DTV for your own use and then put it up on your internet site to sell to others with your own actual experience with this great little TV as a real use write-up of how nice it works. 9-inch widescreen LCD television with ATSC digital TV tuner. DTV - DTV - digital TV with ATSC receiver for the United States, Canada, South Korea, Mexico, and certain Central and South American countries.